Manhattan Mineral Collecting: recently collected mineral specimens found on Manhattan Island, NY. Mineral collecting in Manhattan? It sounds like a contradiction in terms. Yet anybody who has seen the 700 mineral specimen collection of the New York Mineralogical Club knows that at one time Manhattan was a mineral collector's paradise. (See my article: The Minerals of New York City.) The club collection contains minerals collected by noted collectors as Kunz, Niven, Chamberlin, Schernikow, Gratacap, and Manchester. And these minerals were not ordinary, in fact some were extraordinary like the 6" almandine garnet found during subway excavations at 36th Street and Broadway, and a chrysoberyl crystal that Joseph Peters of the American Museum of Natural History has described as "the finest specimen of chrysoberyl found in the United States" found at 93rd Street and Riverside Drive. But these minerals were found in the early years of when subways, skyscrapers, tunnels, canals were being constructed. Now much of Manhattan is built over or covered by asphalt. The building sites that are actively excavating bedrock do not allow mineral collecting because of liability concerns. Where can a mineral collector go in Manhattan? Surprisingly, there are several areas in northern Manhattan that still are producing fine minerals. Most recently I got a call on a Friday night from Ted Zirnite. When I answered he said "Are you sitting down? Well, I just collected a tourmaline from northern Manhattan!" In my mind I was excited thinking of brilliant watermelon tourmaline similar to those found in the pegmatites in New England. But I also knew that elbaite tourmalines have never been found in Manhattan. Then Ted explained that he had found translucent brown dravite tourmaline in Inwood marble. These tourmalines had recently been described by Lawrence H. Conklin in his excellent article on the Kingsbridge quarrying district in northern Manhattan (Conklin, 1997). Now it all fit. He asked if I wanted to go collect at the site. I jumped at the chance and suggested the next day at 8:00 A.M., a mere twelve hours away. Ted laughed and suggested we didn't have to rush. He suggested a more reasonable hour of 10:00 A.M. I showed up at Ted's apartment in upper Manhattan promptly at 10:00 and saw he had his recent find set up under lights and magnifying glass. It was a very fine double terminated 2 cm. crystal that he had worked away the matrix to expose. The crystal sat on the top edge, so light could pass through from the rear showing the gemmy, translucent quality of the crystal. This was truly a good find. I was ready to go collect. We went to the western shore of Manhattan, where Dyckman Street meets the Hudson River. 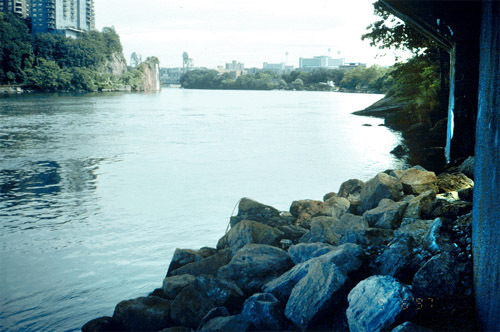 This small basin, known as Tubby Hook, was where we started to follow the Hudson River shoreline north through Inwood Hill Park (Figure 1). Judging from the terrain, the park was constructed from fill to make level ground from the surrounding Inwood Hill. As we progressed north Ted explained that the large boulders that held back the river bank were his prime collecting ground. Several years before, Ted had brought to a New York Mineralogical Club meeting a water-clear, double terminated quartz crystal that looked just like a Herkimer Diamond. 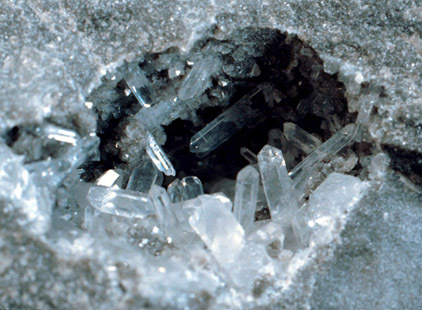 He explained that he had found that crystal in a pocket in a limestone bolder along with dolomite crystals near this site. 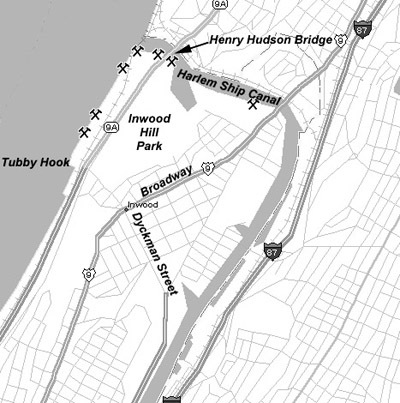 Figure 1 - Map of northern tip of Manhattan Island, New York City, showing collecting locations. Soon we reached the north end of the park - but not the north end of the island. A wrought iron fence that marked the end of the park, stopped at the river's edge. We worked our way around the fence and followed the river bank north. Now we were back to primitive, un-built Manhattan Island. We were still looking at boulders along the shore. Soon we stopped at one. "This is it. Go to it." Ted said. He bent over the back side of a large boulder to show me where he got his tourmaline. There was a quartz-rich layer in the boulder of Inwood marble (Figure 2). This layer had visible many small tourmalines, though none of the size that Ted had found. Then Ted proceeded further north to collect along the river. Figure 2 - View looking west from the collecting site. The boulder containing the dravite tourmaline in the foreground. I could not believe that he was turning it over to me, and that he did not want to collect more. But he had found a big one and the only dravite showing was in small crystals. I started to hammer away, getting a feel for how the rock broke. I knew Inwood marble had been quarried for building stone. That is a sign that the stone "worked" well, that it could be easily and predictably split. After about a half hour of ruining good crystals by unsuccessfully trying to excavate them from the surface of the boulder, I started to attack the entire layer of tourmaline-rich rock. Using carbide-tipped chisels, I started to layout a line. At the ends I notched out large sections to start the fracture. Then continued to chisel along the line. Within four minute the four foot long bolder was split just inside of the tourmaline layer all the way through. I was surprised at how my little 1" chisel had split through a three foot thick boulder, but I was happy about it. 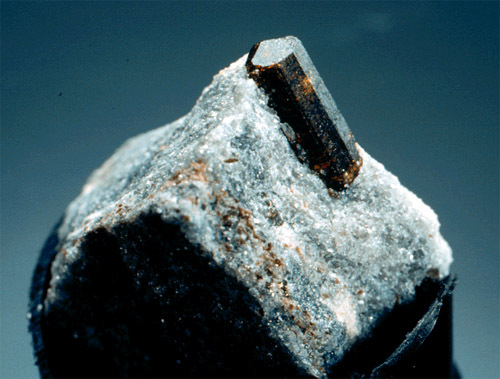 Figure 3 - Largest dravite collected by the author, 19 mm long, frozen in Inwood marble matrix. 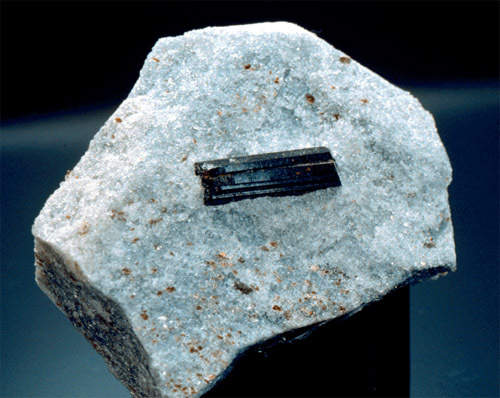 Figure 4 - Terminated dravite tourmaline, 15 mm long in Inwood marble matrix. Now it was simply a matter of splitting off the tourmaline layer. The rock responded beautifully to the chisel and I collected about four flats of dravite tourmaline in marble matrix. Average size of the dravite was 5mm long though they ranged up to 19 mm long (Figures 3 and 4). Terminated crystals, like the one Ted had found, are rare. Most crystals were fractured, probably during the metamorphic process, and you could see sections of the same crystal laid out like sliced bread frozen in matrix. But there were terminated crystals. The Inwood marble matrix is quite soft and easily worked to expose crystals. Some specimens were very rich in dravite surrounding calcite lens-shaped pods or seams. 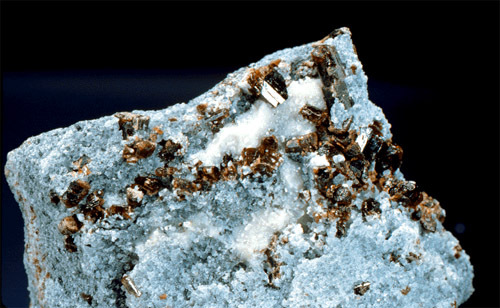 When the calcite was dissolved many dravite crystals were exposed (Figure 5). Figure 5 - Concentrated cluster of dravite crystals around a calcite lens, partially etched away. Specimen is 8 cm across. The boulder of Inwood marble originated further to the east where the Inwood marble extends from the Bronx down into Manhattan Island. It is likely that it was the result of blasting at the time of construction of the Harlem Ship Canal. This large canal cut through the northern tip of Manhattan to make a navigable waterway for shipping where only tidal creeks had existed. During construction the canal cut through several hills of Inwood marble. These were favorite collecting locations of mineral collectors at the time. 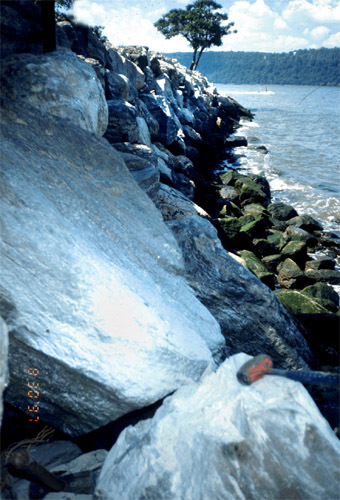 The blasted rock was then relocated nearby and used as land fill to reclaim part of the Hudson river. It is interesting to note that the part of Manhattan separated from the island by the canal is still part of the Borough of Manhattan, even though the tidal creeks are filled and the land is now physically part of the Bronx (Figure 1). Click here to see dravite Tourmaline specimens for sale from this recent find. Meanwhile Ted was collecting some fine almandine garnets in another boulder, this time one of Manhattan schist. It was a sharp 15mm red crystal, unusually well crystallized for Manhattan garnet. But Ted also wanted to show me another discovery that day. He suggested we take a break and go for a quick hike. I left my tools behind, which I soon regretted. We crossed the Amtrak railroad tracks and through another fence up to one of the loop trail through Inwood Hill Park. Directly underneath the Henry Hudson Bridge we left the trail and made our way down to the water's edge. This area is popular with local fishermen, so there were numerous paths through the bushes. Right at the footings of the bridge there were several large boulders that Ted pointed out had seams and pockets of quartz (Figure 6). Figure 6 - View looking east from beneath the Henry Hudson Bridge at the quartz locality. Bridge footings visible at the right. There were several open pockets left behind by Ted from his previous collecting with water-clear, slender quartz crystals in them. Of course we had no tools at the time, and time was short, so I waited until the next day to return with the necessary tool, a 12 pound sledge hammer. The rock, a quartz-rich limestone was exceedingly hard. It took about an hour to breakdown one boulder at the river's edge. And I mean the EDGE. I lost half of the good specimens into the water because the rock broke the wrong way. Some lucky collector that visits at low tide will find some treasures I am sure. Figure 7 - Quartz crystal in a pocket. Largest crystal is 10 mm long. The result were a flat of pockets up to 4 cm across with slender clear quartz crystals up to 12mm (Figure 7). Not big, but impressive when you consider they were collected in present-day New York City. It would be best if we could collect from bedrock exposures to accurately fix the point of origin of these minerals. But there are few exposures left for collecting. We are fortunate to have boulders of recognizable rock to collect from. These boulders are scattered around Manhattan Island and are still available for the adventurous. I wish to thank Ted Zirnite for his willingness share his discoveries with myself and others. His unique ability to uncover minerals where others have ignored originates from his perseverance and creative approach to collecting. Click here to see dravite Tourmaline specimens for sale from this find. Conklin, Lawrence H. (1997) Kingsbridge, An Early Quarrying District on Manhattan Island. Mineralogical Record, Volume 28, No. 6, November-December, 1997, pp. 457-473.